Miss B has been getting into stories lately. Not just reading them: she’s in a sort of storytelling club at school and they’ve been encouraging her to create stories herself. This weekend, at bedtime after we had been playing Dominion, this encouragement really showed. Apologies for just nicking an image of a card. The copyright is somebody else’s. In the game, amongst other cards, we had the Bureaucrat and Throne Room cards. Miss B wanted to know what a bureaucrat is, so I told her something about it being someone who does a lot of work with rules, filling in forms, and so on. This clearly was the source of some inspiration. We had a lovely start to the story: “Once upon a time there was a city. In that city there was a castle. In that castle there was a throne room…” And so on. She did a great job of painting a picture with words, and eventually introduced the character of a bureaucrat who, in the course of the story, learnt that sometimes strict rules aren’t good for everyone and that rules can be changed for the benefit of all. I feel there ought to be some sort of fanfare as we approach the culmination of this year’s Golden Thingummy award, this time mere weeks after the beginning of the process (unlike last time!). So, in the red corner we have the delightfully devious deck-builder, Dominion, weighing in at an impressing 500-ish cards. And in the blue corner we have the rollocking and rambunctious Robo Rally, weighing in at six play boards, eight metal miniatures and a heap of cards and counters. A moat *inside* the throne room? Who’d have thought? Our first game of the day was Dominion. Miss B selected the kingdom cards while I made tea. The tableau was layed out, we drew our initial hands and off we went. This was again a pretty good game. I decided to experiment with just using a couple of kingdom cards (Bureaucrat and Remodel, if you are interested) though I did pick up a couple of other cards later to help cycle through the deck. Miss B was doing nicely largely with Throne Rooms and spies plus some other card drawing actions. Scoring was fairly even through most of the game until the last couple of rounds when I had some good draws while Miss B floundered a bit and I think the game was actually a lot closer than the 16 point gap would have suggested. Miss B was a bit down over the final scores (our previous game had been much closer) and said it was a bad game this time even though she still thinks it is usually good. The cards all sorted and put away we had a short break with drinks and snacks before getting our next game out. 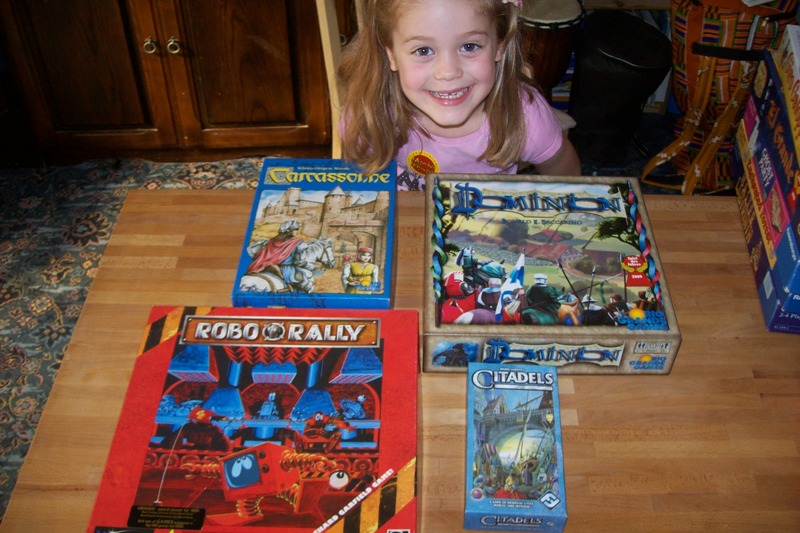 I suggested we used two boards again for Robo Rally, which Miss B readily agreed with and chose the two we would use and fitted them together in the middle of the table. She also decided that this should be a three flag race in order to make the game a bit longer, so she set up the flags too (with me suggesting general vicinities for their location). The game went reasonably well. 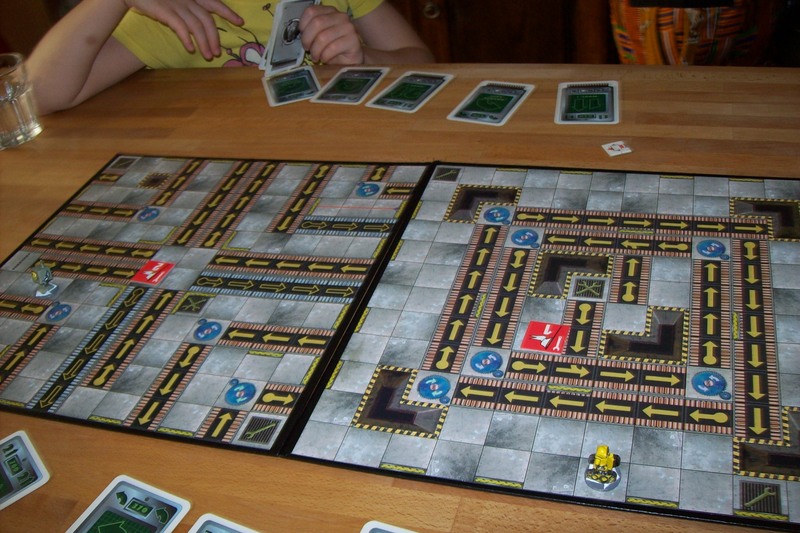 I took a “pretty route”, partly because I fancied surfing conveyor belts and partly because of the cards I had. The rules we were playing were massively cut down: no lasers, no options and Miss B was allowed to program as many (or as few) register phases at a time as she liked, and could change them when the phase came up. To her credit, Miss B usually programmed at least four of the five phases each turn (wanting to reserve her last card until later) and quite often stuck to her choices — though there were a few panics and quick swaps of cards. She was doing well until she got snarled up in a corner somehow which meant that I won this game by a fair way too. 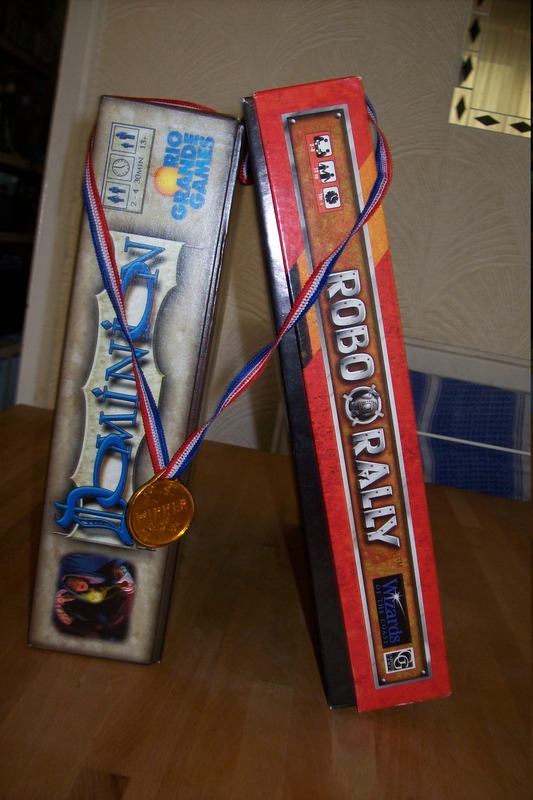 So there we have it: the 2012 Golden Thingummy Award is a draw between Robo Rally and Dominion. I hadn’t expected that. Righto then, I expect we’ll try this again next year. I’m not sure it is fair to have assistance from a dragon. 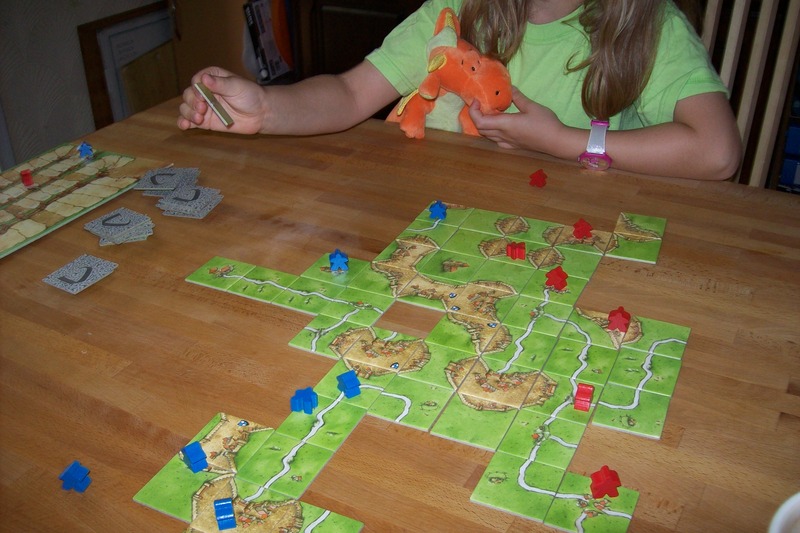 We haven’t played Carcassonne many times with the full rules and not for some time now, as we have been through quite a lot of new games over the last few months. So it was nice to get this old favourite out again and start laying tiles. As usual, the only rule I really have for myself is to not deliberately play to cause problems for Miss B. Other than that, I try not to make dumb moves. This time, I wished I was playing harder. For the first time, Miss B made a really good play of a farmer which, combined with having a pretty good run of the tiles throughout, meant that she solidly and comprehensively beat me. Smiles and high-fives all around. This is the sort of a buzz that I always hoped for when we started playing these games, and it is great when it works out right. After a short break we cracked out Dominion and Miss B set to choosing the kingdom cards. Her selections seemed pretty reasonable, though most of them were four-cost cards, which I felt might restrict the game. I suggested she might want to swap a couple to give more variety but she was happy with the way things were. Fine. So off we went. It’s that combination of doom… again! I’m pretty inexperienced at Dominion and there were a couple of cards in this setup that I’d not used before, but it was really gratifying to see Miss B exploring some of the possibilities as much as I was. 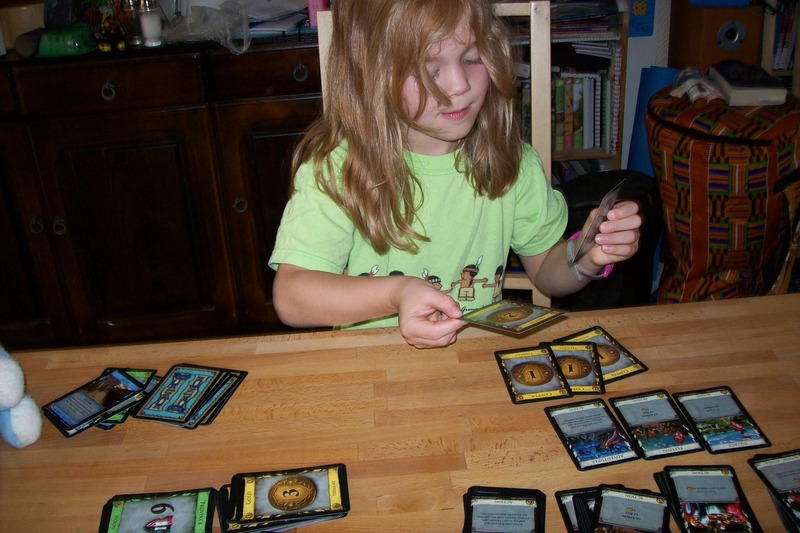 Very soon she was finding that she could combine the Adventurer card (which cycles through your deck looking for treasure) with assorted other cards to great effect. I don’t think she was really thinking of it in terms of building combos, but she was able to work out the best order to play her cards and it was amazing how often she ended up with a hefty fistful of treasure by the end of the action step of her turn. In the end we had a brilliantly close game that genuinely came down to the count at the end. And I won this time. Just. This must have been one of the best gaming sessions we have had yet. Both games worked really well and gave us lots to think about. Dominion in particular seemed to be close to its best, playing quickly with the two of us using very different strategies but both doing well with it. I guess it’s all about the card mix — I’m kicking myself for not noting down what the cards were (though if I look closely enough at the photo I took, maybe…). On sober reflection, Miss B has announced that Carcassonne scored 8 out of 10 and Dominion had 10 out of 10, so we are pleased to announce that Dominion is the first finalist for this year’s Golden Thingummy award. You may remember that last summer Miss B and I selected a few games to play off against each other and see which one we liked best. By “we” I meant, of course, Miss B, who has the final vote in all things. I took a long time to write all this up but the eventual winner was the worthy Enchanted Forest. Quite a decent pile of games — and we missed a couple out in this picture! 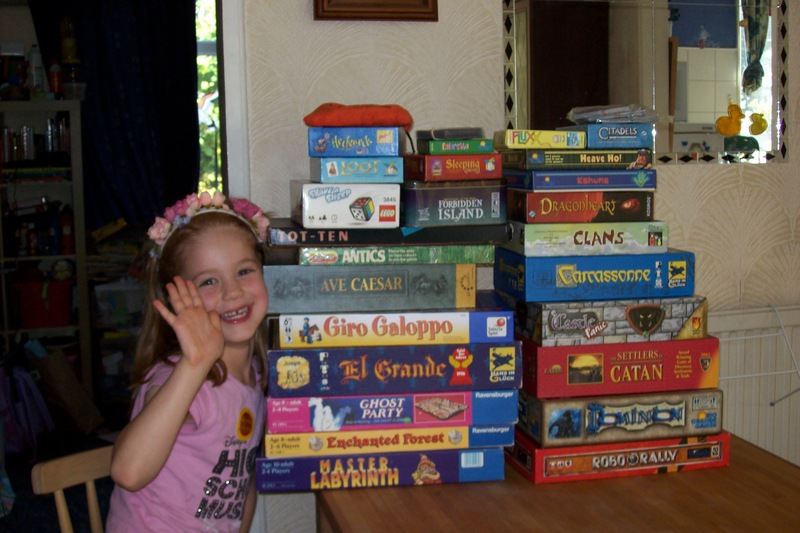 The selection procedure for the shortlist is that we make a big pile out of the games that we have played over the last year (the ones that we can play with just the two of us, anyway) and Miss B selects two of them. I then choose two more games that I think would be good contenders (based on the fun we have had with them plus a bit of my personal bias). Dominion. Miss B said, “I’m not sure why but I just like it.” I reckon this is a good, if slightly surprising choice. As long as we can keep the most disruptive cards (like the Witch) out of the game, we can have a lot of fun with this. Robo Rally. Miss B said, “I like Twonky because I could make it out of a box.” A slightly random comment, but for those of you not in the know, Twonky is one of the robots in the game, and looks like a cute walking television (not at all like Evil Edna). I’m not sure this game is a strong one for us right now: we’ve played it once and it is a bit of a struggle, even with enormous concessions made to make it easier for Miss B. We’ll see. And here we have our 2012 shortlist. This is going to be fun. Carcassonne. We’ve not played this for a while, but it has always gone down well and is just a solid, fun game. Citadels. A new one to us, but has already had a few plays and is becoming a firm favourite with a nice combination of ease of play and layered bluffing and psychology. If I had a third pick it would probably have been Coloretto, which is just great. After spending quite a while trying to come up with some clever way to introduce Miss B to Dominion, I finally decided that I was over-analysing, so decided to just cut the game back a bit and give it a go. If it all went horribly wrong, we could give up and try something else later. If in doubt, buy gold. 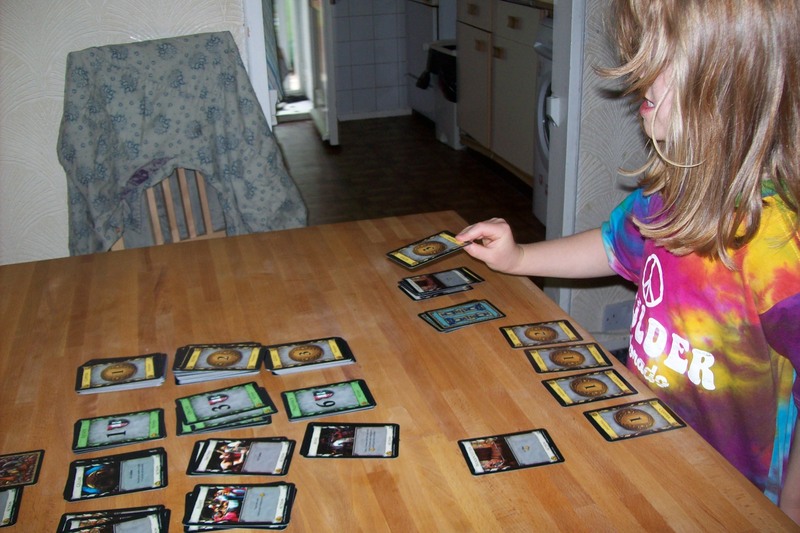 In case you don’t know Dominion, it is a game that spawned an entire new style: deck building games. It has a lot in common with some collectable card games in that there are relatively simple rules and cards with effects that can interact in exotic ways. What happens here, though, is that players begin with a small, skeleton deck which allows them to buy other cards from a selection on the table, and these make the decks grow during play, adding more options as you go along. Dominion has a selection of 25 stacks of ten “kingdom cards” in the basic set (several expansions are available) of which ten are selected for each game. If you do the sums that means that there are over three million ways to set up a game, which means that the game offers enormous variety, especially when you start buying those expansion sets. I thought that one major cause of problems could be having too many options available, so we used just five kingdom cards, selected by me picking cards that I figured wouldn’t cause too much confusion and from that set, Miss B chose cards she liked the look of: Cellar, Woodcutter, Smithy, Feast and Mine. Plus in order to shorten the game, we only had five cards in each pile, including victory cards, with the game ending after running out of cards in any two piles or just the Province pile. Aside from that we played the standard rules, though I played gently without trying too hard. Another likely issue was with shuffling. 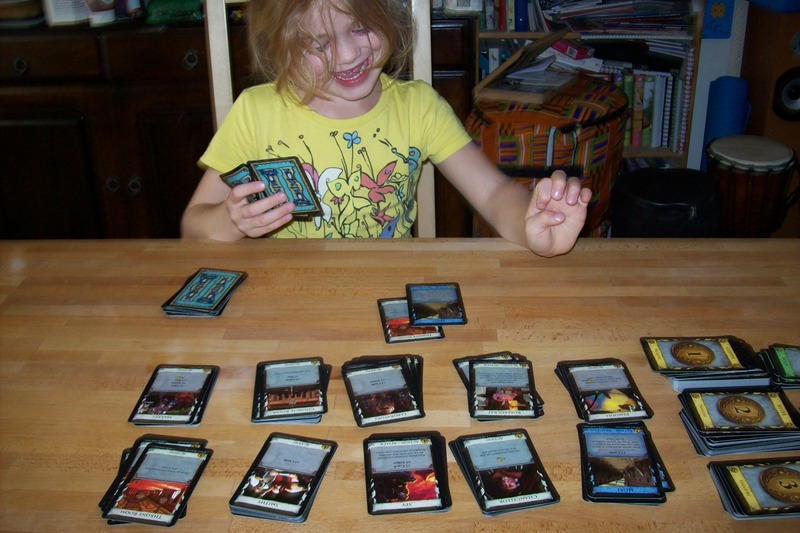 A feature of Dominion is that there is a lot of deck shuffling, and Miss B only has little hands. Sometimes she went through a simple “deal to a few different piles” shuffling routine, which is pretty effective, if slow. Other times I did the shuffling for her. We even tried using an electric card shuffling machine a few times which, though fun, was not particularly quick when Miss B had to first split the cards into two even halves, and isn’t really designed to be shuffling a 20 to 30 card deck. Now Miss B has tried it, though, she wants to use it at every opportunity. Overall the game went really well and we both had fun. 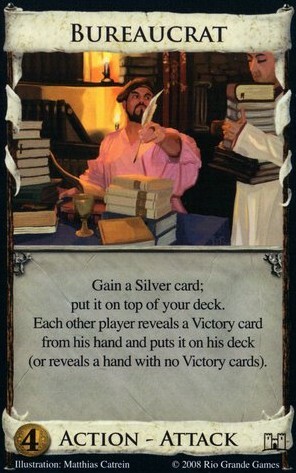 I think that one of the trickiest parts of Dominion is in figuring out when to start buying victory cards, and this is still a problem in our cut back version, so it may be worth coming up with some tweak to help with that. Or maybe I’m over thinking things again and we can just leave things as they are. The verdict from Miss B (aged 5½): “It was good. I liked the shuffler and getting gold.” So, swayed by gadgets and bling! 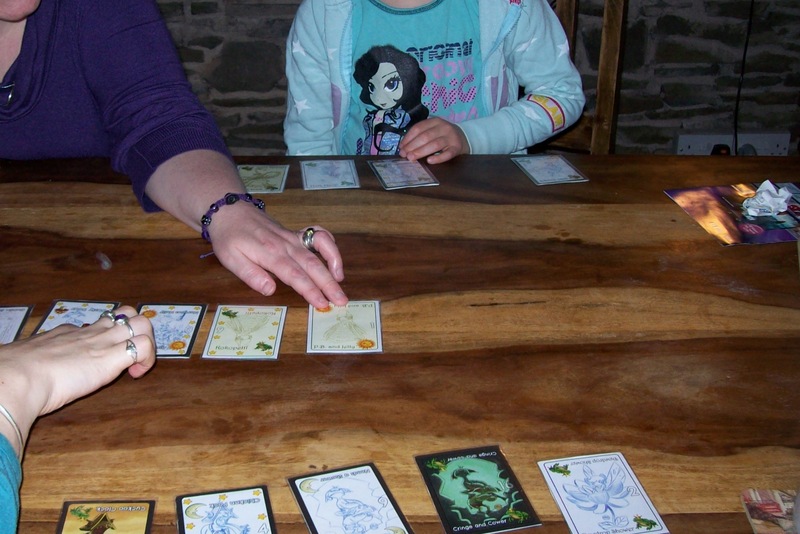 The game: Dominion (Rio Grande), 2 to 4 players aged 13+. More goats? You should set up a farm.